Van Oossanen Naval Architecture teams up with Milanese designer Federico Fiorentino for a new 47.5 metre superyacht concept, called XL-300 Sport. The concept is a follow-up to the 61 metre Fast Displacement XL-500, which was designed in collaboration with Cor D Rover and revealed at the 2016 Monaco Yacht Show. The exterior styling was provided by Fiorentino, who is described by Perry Van Oossanen as “one of the most talented designers we have worked with”. Cristiano Gatto was appointed for the interior styling of the XL-300 but there are currently no renderings. The yacht accommodates ten guests traditionally in an owner’s suite on the main deck, three double cabins and one twin cabins on the lower deck. There is also the area for a crew of six in three cabins with en-suite bathrooms. 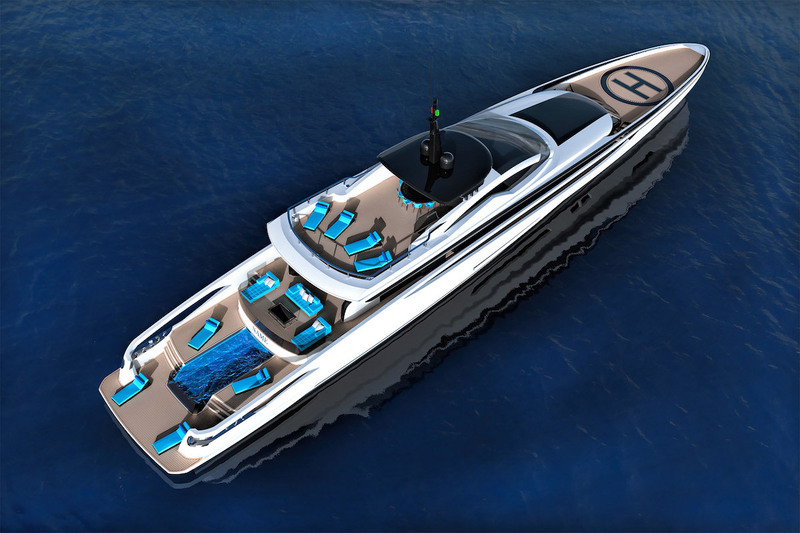 Fast Displacement XL-300 Sport will feature a helipad on the foredeck, an aft-deck infinity pool and a side-loading garage that is large enough to house two Jet Skis as well as a 6.25 metre tender. The project developers expecting a maximum speed of 29 knots with two 2,600 hp MTU 16V2000 M96L diesel engines. You can enjoy speed but the yacht will also have a transatlantic range of 3,500 nautical miles at 12 knots.